Modern homes are really unique because aside from its use of sleek and straight lines, it has incorporated technology to its design. There were also houses that added different twists to the designs. Even the structures are intelligently analyzed like how cantilevered homes or suspended house designs are created. 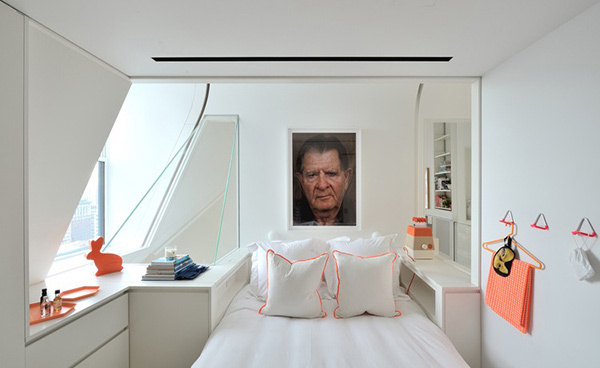 But aside from that, there are homes that went beyond the usual designs like the Skyhouse penthouse in Lower Manhattan, New York City. 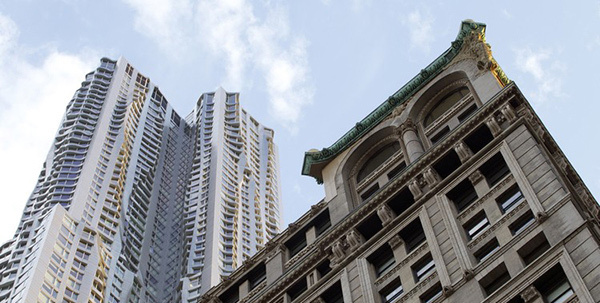 This penthouse is located on the top four floors of a skyscraper in Lower Manhattan. The place was completed in 1896 as the headquarters of American Tract Society and it remains standing to this date. What make it a good choice for the penthouse are the panoramic views of the urban landscape that includes the Brooklyn Bridge, St.Paul’s Chapel and the Empire State Building. 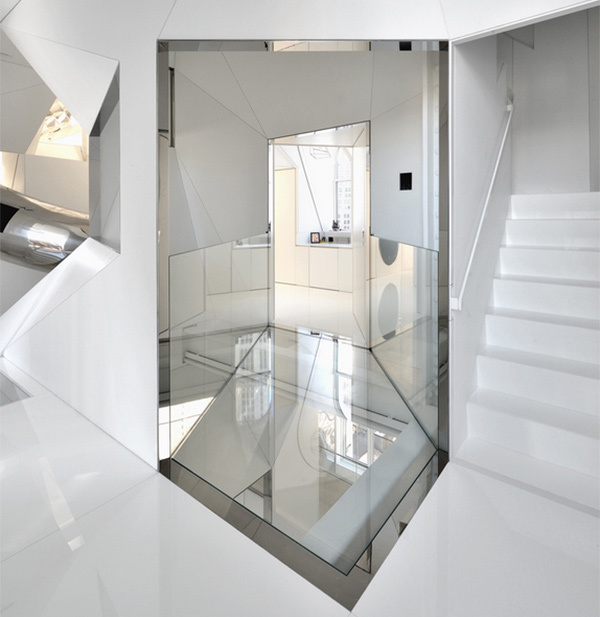 Instead of stairs, this penthouse has rock climbing walls and metallic tubular slides used to navigate areas of the house. But there are also some stairs inside in the house. Isn’t that amazing? The interior design of this penthouse is also impressively done. 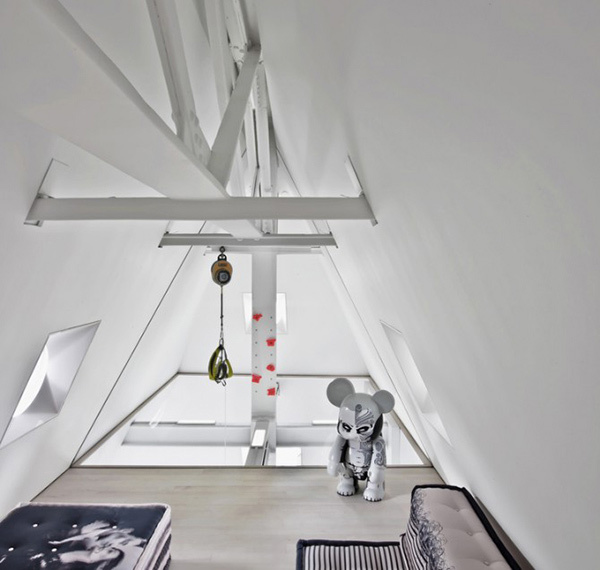 All the areas of the house can be fully utilized including the mezzanine nooks, alcoves and annexes. 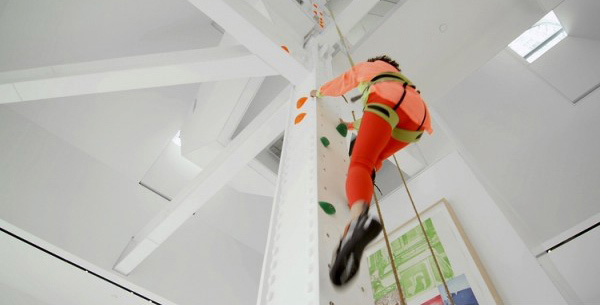 In the living room, one will find a fully-functional climbing column that is 50 feet (15 meter) high. Above the living room is a floral lounge where one can relax while overlooking at the impressive views of the city. 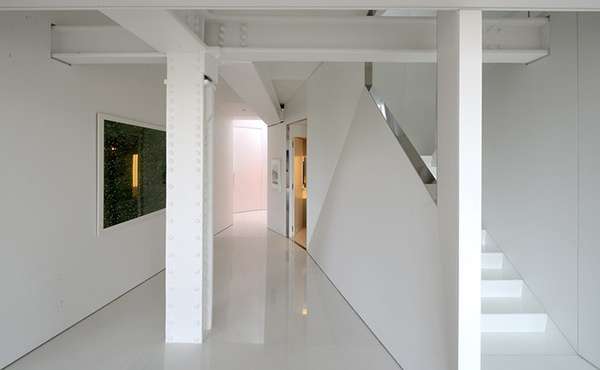 On the upper-most floors are angular bedrooms in white and muted neon. 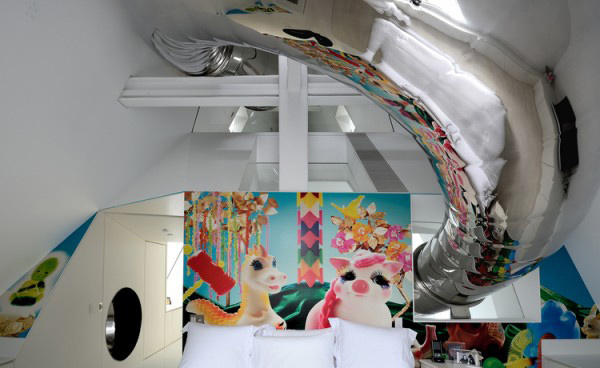 The modern interior of this penthouse looks unique because of the wall climbing column and the 80 feet (34 meter) slide that sprawls throughout the home’s interior. Let us take a look at the Skyhouse below. Also, you will be able to see a video of the house. The skyscraper is where this unique penthouse is located. Outside, no one would expect that there is a great wonder waiting at the top. This is a unique, light and airy home especially with its choice of colors. 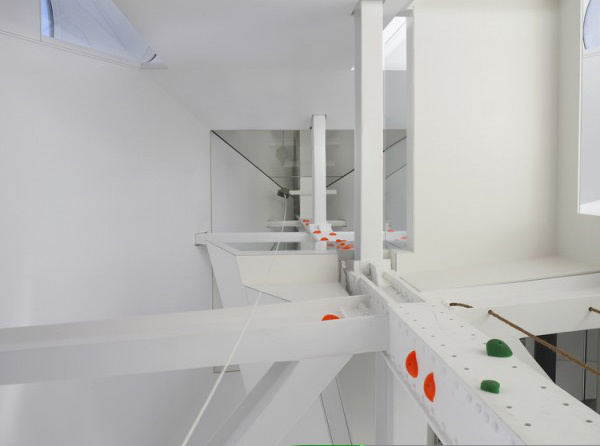 The use of white and accents of orange and green creates a modern contemporary space. 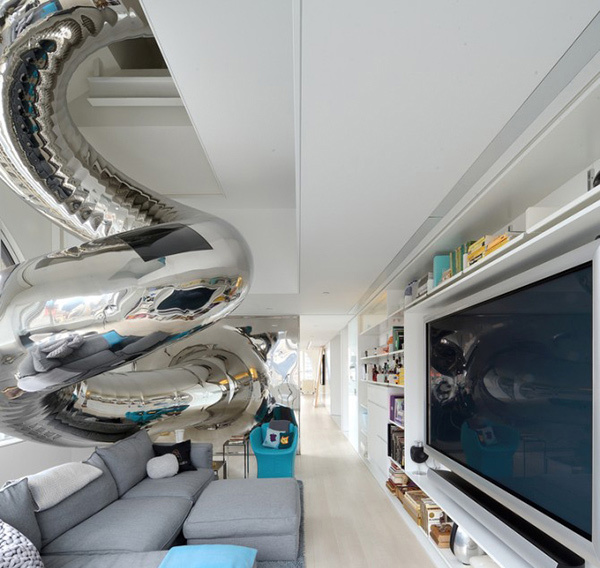 But what set this apart to any home are the rock-climbing columns and the metallic slide. This could not be suitable to everyone but for the homeowners, it is the kind of living they want. 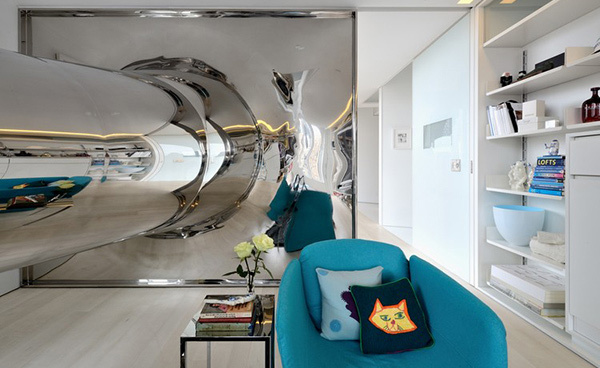 The design was cleverly done by Architect David Hotson and Interior Designer Ghislaine Viñas. 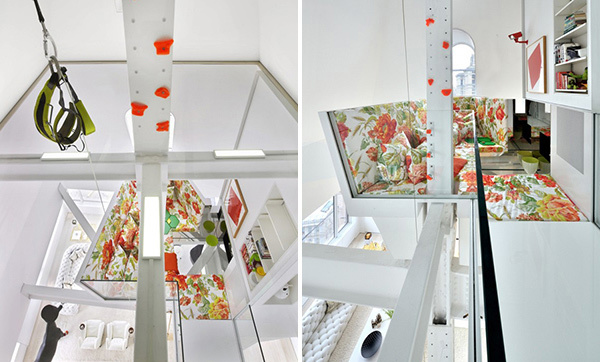 We would give them a standing ovation for the design of the Skyhouse!